A Dutch study to determine the impact of offshore wind farms on wildlife has turned up surprising results. Located off the Dutch North Sea coast, the offshore wind farm near Windpark Egmond aan Zee, was put under the spotlight by scientists at the Institute for Marine Resources and Ecosystem Studies at Wageningen University, who revealed there to be “hardly any negative effects” on fauna. 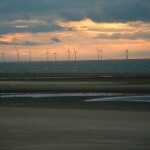 Anti-wind farm campaigners have long since argued that the renewable energy technology can have a negative impact on birds and prove disruptive to marine life. However the study would appear to prove that the contentious issue isn’t quite so black and white. The study – sponsored by NoordzeeWind, a joint venture of Nuon and Shell Wind Energy – focused on the short-term ecological effects. It was determined that offshore wind farms can in fact contribute to increased biodiversity, providing a new natural habitat for sea life, such as crabs, anemones and mussels that are attracted to the turbine foundations and surrounding rocks. In the case of marine mammals and fish, the wind farm was found to provide an oasis of calm, while seagulls appeared undisturbed and gannets were noted to avoid the wind turbines. Consequently, it seems wind farms can actually have a long-term beneficial effect on wildlife. Scientists ultimately concluded that the impact of offshore wind farms on wildlife is dependent on location and the depth of the sea surrounding the turbines.